Guaranteed matches are exact matches that also take into account the context of the current segment. 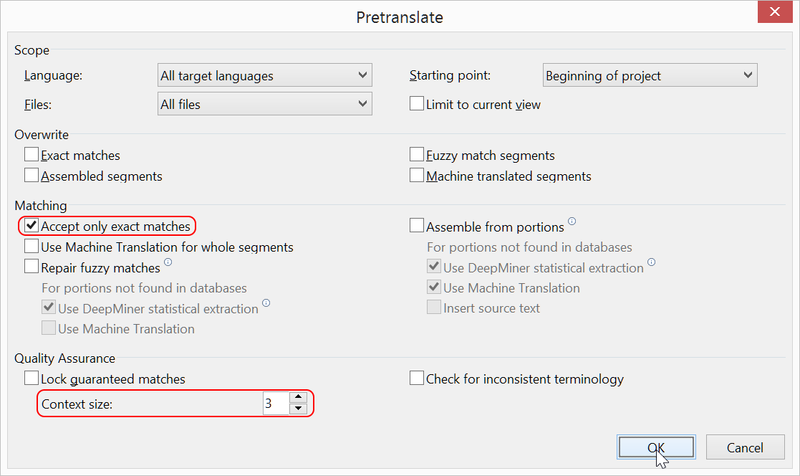 This means that, in order to be marked as a Guaranteed match, the current segment must exist in the Translation Memory, as well as one or more segments before it and one or more segments after it. This article will provide examples to show how Guaranteed Matches work in Déjà Vu. Then, we add the translations to the Translation Memory. We PreTranslate this new file using the option Accept only exact matches (for simplicity), and a Context Size of 3. The context size specifies how many segments Déjà Vu will look for to establish that the context of the current segment also matches what is in the Translation Memory. A context size of 3 specifies that Déjà Vu will check the previous segment, the current segment and the next segment (a total of 3 segments). The first 2 segment are marked as Guaranteed Matches (be default, orange), and the rest are marked as Exact Matches (by default, dark green). The segment "Oración de muestra 001." was followed by the segment "Oración de muestra 002" in the first document, and the same thing happens in the second document, so that segment is marked as Guaranteed in the second document after PreTranslation. The segment "Oración de muestra 002" was preceded by the segment "Oración de muestra 001. ", and followed by the segment "Oración de muestra 003." in the first document, and the same is true in the second document, so it also gets marked as Guaranteed. The segment "Oración de muestra 004." was preceded by the segment "Oración de muestra 003. ", and followed by the segment "Oración de muestra 005." in the first document, but not so in the second document. Although the segment itself is the same in both documents, its context is different, so the segment "Oración de muestra 004." is marked as an Exact Match in the second document, and not as Guaranteed. Click here to learn how to enable Déjà Vu to find Guaranteed Matches.